1000 years is, indeed, a mind-boggling figure. However, that is the actual age of professional musical art in Russia. 1000 years is nothing when it comes to what is called ‘the national culture of peoples of Russia’. The Protoslavs, for example, were molded as a uniform ethnic formation in the 3rd – mid-2nd Millennium B.C.! Clay whistles… Anyone who has children will confirm: children manifest a consistent interest towards these common toys. No state-of-the-art computer games can do a thing about this! The Fire cult and Water cults, he worshipping of the trees and animals – these are all ancient forms of magical perception of the world by Mankind. The folklore of the Slavs bears traces of the ancient Fore-history of Mankind. This, for example, is a repeated ritual at traditional weddings of the Russians, Byelorussians and Ukrainians — the newlyweds are led up to the festively laid table, and seated on a wild beast’s skin. The insistent desire to ensure fertility and well-being has been thus manifested in an ancient ritual for no less than three thousand years! Understandably, archeologists have every ground for producing exact dates as a result of their finds, just as linguists have a claim to specific data. How do ethnographers or music folklore experts similarly time their discoveries? 2000 or 3000 years – where does such an age spring from? The 2nd Millennium B.C. is the specific period that experts in diverse fields of science pinpoint as marking the birth of the yearly circle of rites. The springtime awakening of Nature, when the birds and beasts give birth to their young, the beginning and ending of the sowing – in their rites, songs and dances our distant ancestors embarked upon a magical dialogue with Mother Nature. Experts call them ‘calendar’ songs. The age of a specific people is estimated by the number and diversity of these ‘calendar songs’. So, by these estimates the Slav peoples are, indeed, of an impressive age! Judging by all accounts the Christmas ‘kolyadki’, or ‘carols’, have very little relation to the modern day Christmas feast. The youngsters ‘exhort’ treats from the hosts of each household they visit, while the latter never allow them to cross their threshold! The treats are meted out on the doorstep… On New Year’s eve, our ancestors firmly believed, the evil forces gain strength, and the only way of neutralizing them is by bribing them to go away! The processions of carolers to this day resemble a gathering of the evil forces! It’s a masquerade of sorts, with a predominance of animal characters, headed by the Nanny goat! This very Nanny goat was elevated to the rank of almost overwhelmingly principal character in Slav folklore, making an appearance in songs, dances and rituals at the most vital moments! One of the oldest on Earth – the Fire cult is the quintessence of a majority of Slav feasts. There’s the repeated ritual of the burning of the huge effigy – we come across it in the culmination of Shrovetide, in the May holiday of the Funeral of Kostroma (it’s hard to imagine from what mists of time this effeminate, eyeless effigy, that had to be burnt before advent of summer, actually hails from!). When scanning the tales in preparation for the program, I wondered: Why is it that the bear became the principal character at Russian fairs? Didn’t this, perhaps, stem from our ancestors’ desire to flaunt their ephemeral superiority over the Forces of Nature, with the bear as their symbol?.. Of course, it’s not accidental that Rimsky-Korsakov, who scrutinized at length the history of his own country, recalled this particular song in his opera. 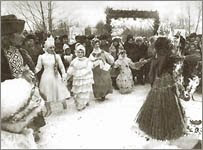 His “Snowmaiden” is a miraculously precise and convincing reconstruction of the springtime rituals of our distant ancestors. Lada, the Slav Goddess of Love and Marriage – can be regarded as the younger sister of one of the most ancient of Slav Goddesses Makosh. “Moist Mother-Earth” is another way the olden folk referred to her. The ‘essence’, ‘the first principle’, ‘one who rules destinies’… Memory of this ancient goddess has been preserved in folk embroidery — an anthropoid figure with arms raised to the Heavens — and even in some folk customs! Now let’s remember the famous ballet by Igor Stravinsky — “The Rite of Spring”. “A religious ceremony of Ancient Russ – Heathen Russ,” — wrote the composer himself about his brainchild. “My musical ear suggested to me what the voices of our ancestors might have been like.” The endless circle of life, the majestic footsteps of Time, the lofty splendor of Nature – Stravinsky’s music reflects all this in full measure. Take note: “The Rite of Spring” was how the author chose to entitle his composition. A time of rituals of the ancient Slavs, who strove to enlist the help of the Gods in their attempt to stoke up this eternal vortex of Life. Veles, the Livestock God, is one more representative of the pagan deities of the Ancient Slavs and a most influential figure in the life of the ancients! Incidentally, he not only oversaw very important daily affairs, but also watched over the songs and tales of the good folk! …Right before the first few dozen years of the 20th century in practically all corners of Russia one could come across the psaltery players – folk tale narrators. They were highly respected by everyone. “Bayan’s Sons” — is how they were called. This is a quite specific historical association: Bayan was one of the most famous folk tale narrators of the Russian Middle Ages. Its none other than Bayan who launches the story, narrated by Pushkin in his poem “Ruslan and Ludmilla”, and by Glinka in the eponymous opera. However, here is a curious fact: Russian folk narrators had yet another ‘name’ – “grandsons of Veles”! Both Pushkin and Glinka recall the Goddess of Love Lada. The lead character of both the poem and the opera – Ruslan — addresses the ancient deity – God of Thunder Perun, who was also the ancient Slavs’ Patron of the Warriors.